Where Are the Mouse Buttons on My iMac? El Capitan takes a visual approach to everything. Your iMac is designed for point-and-click convenience. That’s because the mouse (or trackpad) are your primary navigational tools while you’re using your iMac. Of course, you move the body of the mouse and the pointer follows like an obedient pup. Likewise, you move your finger over the surface of the trackpad to move the pointer. (The faster you move your finger, the farther the pointer goes.) When your pointer is over the desired item, you tap it (or click it, if you prefer the more familiar term), it opens, you do your thing, and life is good. But wait! If you’ve grazed on the other side of the fence — one of Those Who Were Once Windows Users — you’re probably accustomed to using a mouse with at least two buttons. This brings up the nagging question: “Where the heck are my mouse buttons?” Or perhaps you’re thinking even farther out of the box, and you ordered a Magic Trackpad 2 as your pointing device of choice. Again, no buttons! In a nutshell, the “buttons” on your iMac’s Magic Mouse 2 (or Magic Trackpad 2) are the entire top surface! Although you won’t see any separate buttons for clicking, your Magic pointing device can tell when you tap with one finger (to single-click). iMac owners should think “tap” whenever they read “click” in the Apple world. If you’ve used an iPhone, iPad, or iPod touch, the idea of tapping something onscreen makes perfect sense. To configure everything Magic Mouse 2 — including all your buttons and your double-click/tracking/scrolling speeds — visit the Mouse pane within System Preferences. You can also configure your wireless mouse from here as well. Similarly, you can configure your wireless Magic Trackpad 2 using the Trackpad pane. Speaking of right-clicking, you can easily configure your Apple pointing device to recognize a right-click (also called a secondary click) within System Preferences. Tapping the top-right corner (of a Magic Mouse 2) or tapping with two fingers (on the Magic Trackpad 2) performs the same default function in El Capitan that clicking the right mouse button does in Windows. Namely, when you right-click most items — icons, documents, even your Desktop — you get a shortcut menu of things. That is, you get more commands specific to that item. 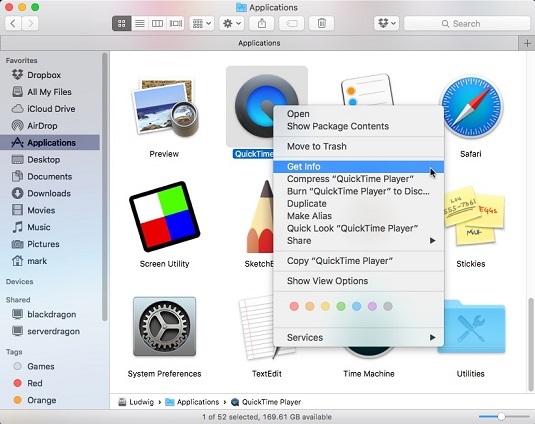 Check out a typical convenient right-click menu in a Finder window. Welcome to your shortcut menu! If you’re using a Magic Trackpad 2 with your iMac, never use any object other than your finger (or a trackpad stylus) on the trackpad surface! That means no pencils (no, not even the eraser end), pens, or chopsticks; they can damage your trackpad in no time at all. And no, that doesn’t bode well for ladies with long fingernails. Double-clicking: Tap twice with one finger to double-click. Scrolling: To move in any direction within a document window, swipe two fingers across the surface in that direction. Two-finger paging: Swipe your thumb and first fingertip to the left or right across the surface to page through a document or move to the next or previous image in a set (like web pages in Safari or photos in your iPhoto library). Two-finger zooming: Pinching your thumb and first fingertip toward each other on the surface zooms in on a document or image. The reverse (moving your fingertips away from each other) zooms out. You can also enable zooming with a modifier key. Three-finger full-screen switching: Swipe your thumb and first two fingertips to the left or right across the surface to move between open applications in full-screen mode. Rotate: Place your thumb and index finger on the surface and turn clockwise (or counterclockwise) to rotate a photo. Select the Look Up & Data Detectors check box: If your iMac is equipped with a Force Touch Magic Trackpad 2, you can choose how Force Click operates. Note that this advanced option will not appear if your iMac has an older trackpad. Enable the Look Up check box: Tap the trackpad with three fingers to look up a selected word in the Dictionary. Enable the Three Finger Drag check box: (Sounds like a dance from the ‘60s, doesn’t it?) By using three fingers, you can drag around windows on your Desktop to reposition them. Adjust your tracking speed and Force Click pressure: Click and drag the Tracking speed slider to speed up or slow down the rate at which the pointer moves. The Click pressure slider controls how hard you must press to activate Force Click. Perform actions within OS X itself: Using the combination of thumb and fingers you specify, you can configure the display and operation of many features within El Capitan. You can visit the Mouse and Trackpad panes in System Preferences to simply experiment with the possibilities of Multi-Touch. Each gesture is demonstrated with a video clip, making the gestures very easy to learn!